Toyota's new robot butler - descriptively named the Human Support Robot - has been designed to assist the elderly and the disabled to lead more independent lives. ...the robot weighs 70 lbs and is capable of holding objects that weigh up to 2.6 lbs with its simple two-fingered gripper. Designed for use indoors, the robot travels at a max speed of 1.8 miles per hour. It can overcome bumps in the floor up to 0.3 inches (enough to traverse from hardwood to carpet) and can climb slopes up to 5 degrees. Although not specifically mentioned in the press release the robot appears to have both a Prosense (Microsoft Kinect) sensor and stereo cameras in its head, which would allow it to sense depth and visually identify people and objects. Toyota has been testing the HSR with the cooperation of the Yokohama Rehabilitation Center since 2011, with patients providing feedback on the robot's design. 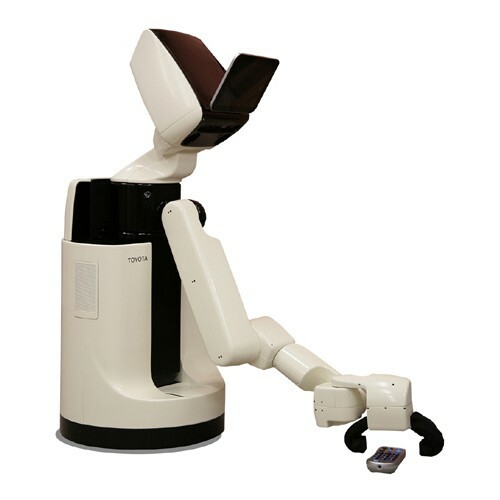 The company will be demonstrating the robot to the public from 26- 28 September at Tokyo Big Sight as part of the "bleeding edge development of health care equipment" project. Update 17-Oct-2012: Click the link to take a look at the Human Support Robot video, showing the robot in action. End update. Based on the iRobot Create platform, Belvedere can move around avoiding obstacles (like small children), tell jokes and even dance. HERB is "a bimanual mobile manipulator comprised of two Barrett WAM arms on a Segway base equipped with a suite of image and range sensors." The El-E robot is intended to provide assistance to people with limited mobility. From Toyota (Japanese) via Gizmag.